The Express Water RO5DX is one of the budget choices we included on our list. This reverse osmosis system is small enough to fit into a normal-sized kitchen cabinet, and it’s easy to install, so most people will be able to do it themselves. In the following article, we take a closer look at the advantages and disadvantages of using this filtering system, and at how efficient it is. One of the advantages of using this filtration system is that the faucet is stylish enough to use in every kitchen, no matter if it has a traditional or modern design. Not only does the faucet have a good design, but it is also capable of delivering a flow rate of 0.8 GPM. Another advantage is that this system uses high-quality filters. These filters are capable of removing up to 99.99% of the contaminants found in your water source. The filters are also easy to replace, and they are rather cheap. Installing this unit is simple enough, so even people who are not used to involving in DIY projects will be capable of installing it in under one hour following the installation guide. All the elements are color coded, so assembling the system will be a piece of cake. The Express Water RO5DX is an efficient unit. The wastewater pure water ratio is 3:1, so even if that ratio might seem like a wasteful one, it’s actually pretty good. 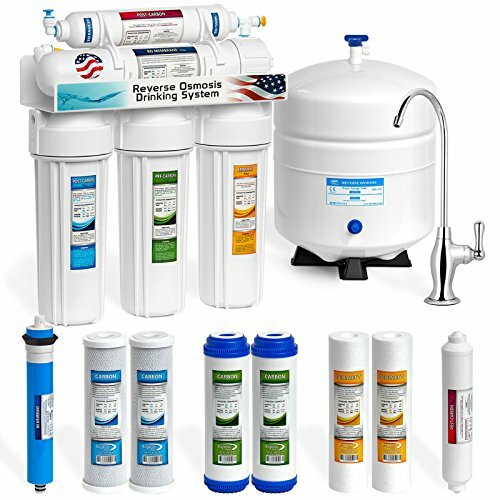 Some reverse osmosis systems can waste up to 24 gallons of water for every gallon they filter, and efficient ones waste up to 4 gallons. With a ratio of 3:1, this system is considered above average when it comes to efficient units. There are many advantages for using an efficient RO system, but the most important are that you don’t have to pay a lot for wasted water, and it’s also more environmentally friendly. 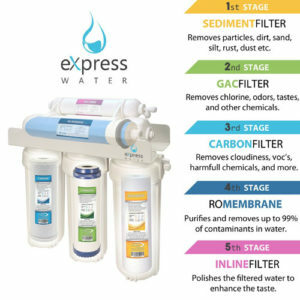 The Express Water RO5DX uses a standard 5-step filtration process to purify the water. The filters used are very efficient, and they are able to remove up to 99.99% of the contaminants in the water, depending on your water source. One of the great things about this system is that the filter cartridges and their casings are color-coded, so you will always be aware of which one goes where. This makes the filter changing operation simple and straightforward. You remove a used filter, you find the spare which has the same color, and twist it in its place. You won’t need any additional tools for this operation except the filter wrench provided by the manufacturer. Another advantage is that a spare set of filters comes with the unit, so you will benefit from fresh water for at least a year before you have to spend more money on spares. The filters have to be changed once every 6 months, or even more often, depending on your water source. 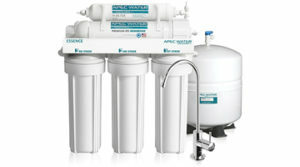 The reverse osmosis membrane has to be changed once every 2 years. The Express Water RO5DX is pretty easy to install. Most people will be able to do it themselves in under 2 hours. If you don’t have any previous experience with DIY projects, and you’re worried that this installation process might be above your skill set, don’t be. The instruction manual is easy to follow, and it will guide you step-by-step through the installation. All you need is patience. One of the good things about this model is that it comes with the filter portion pre-assembled. This alone will save you up to 45 minutes from the installation time. You should follow these steps if you want to install the RO system quicker. First, install the faucet, leaving the tubing at full length. Next, install the input line for the cold water pipe. Install the water tank next, leaving the tubing at full length. Install the drain tube next, and only after that should you assemble the connections. Another advantage of this RO system is that it comes with a leak stopper. The leak stopper shuts off the water flow once the water tank is full, so there won’t be any leaks.